Edition of 1890 of which 300 copies are signed 1-300, 26 copies are signed A-Z as artist's proofs, and five sets are signed as progressives. 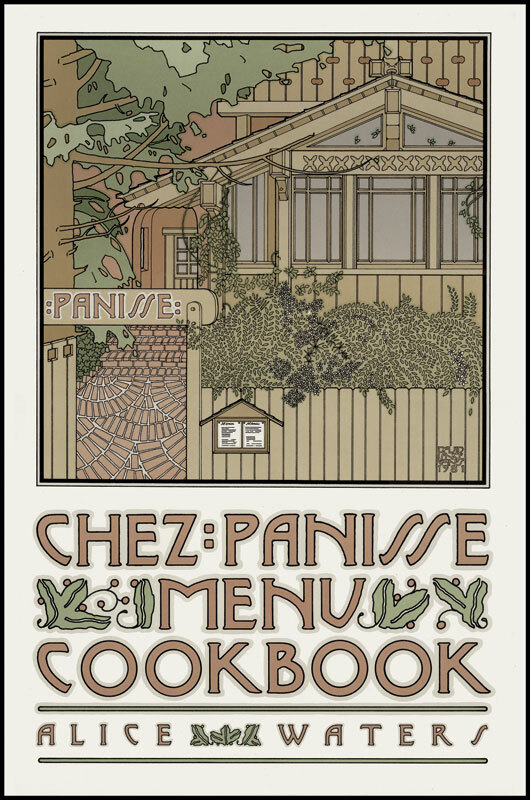 December 6, 1981 10 colors 15-1/2" x 24"
Client: Chez Panisse Restaurant & Random House Publishers; 1517 Shattuck Avenue, Berkeley CA 94709. Telephone (510) 548-5525 A-Z: Artist's own use. She told me that she couldn't cook. I told her that I didn't care. The first thing I thought of was the food my brother brought me twenty years ago up in the Yukon, across the Stewart River. Glop plus love equals a memorable meal. The second thing I thought of was the green soufflé. That was ten years earlier yet. We didn't understand about copper. Yes, it makes the egg-whites fluff, but the bowl has to be shiny clean. When the dish came grass-green out of the oven, we realized that if we were to eat it we would surely die. We threw it out and had popcorn for dinner. Then we made love.